Keep your kids safe on the net. K9 Web Protection is an Internet filter and parental control software for your home Windows or Mac computer, iPhone, iPad or Android device. It is free for home use, and costs $1.25 per month and computer for educational organizations (June 2012). A classroom computer should be carefully monitored for all activity that takes place on it, so that teachers can review the activity to make sure that it falls within the acceptable use as defined by both the school and the parents. A useful, free and open source application that can help with that is an application called KidLogger. Zoodles.com is a simple, safe, and free web browser for young children, created by a team of educational professionals with your child's Internet safety in mind. Kids love the Zoodles browser because it offers them a virtual toybox full of educational, entertaining sites that are age- and interest-specific. The following websites are some of the best resources that parents and teachers can use to introduce kids to some of the things they need to be careful about when they are spending time on the Internet. 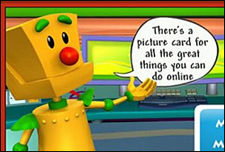 Free Internet Browsers for Kids: KidZui.com, Kidoz.net and More!